In the episode "One of Us" there was one cool moment that deserves to be highlighted. Skye was attempting to control her new seismic "Quake" powers and was apparently forcing the waves to go inside herself. According to Simmons this had the effect of causing hundreds of hairline fractures and burst capillaries in her arms. Simmons help construct a kind of Gauntlet for Skye. They did not look much but his is likely the first iteration of the Gauntlets worn by Skye's comic countpart Daisy Johnson. 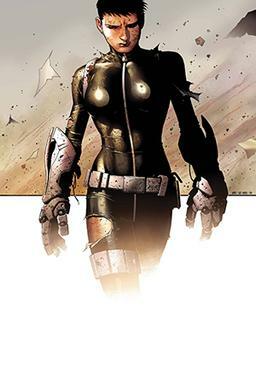 Skye is in a sense still evolving toward Daisy Johnson. She is not there yet. 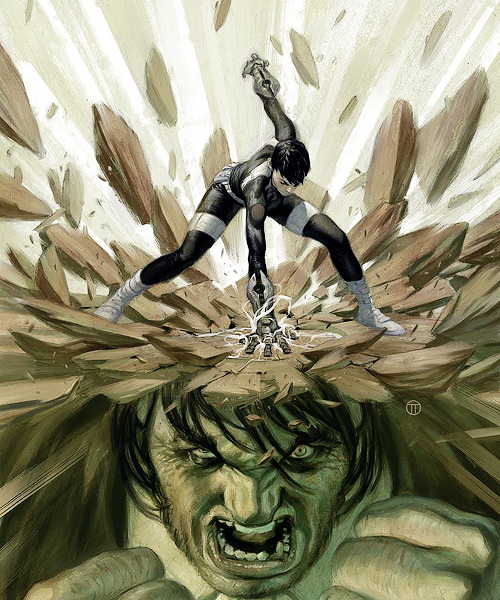 Keep in mind that Fury chooses Daisy Johnson has his right hand Woman to build a new team around. He did this with the thought that she is a highly trained agent, and has super powers. Skye is getting very close to this, she just needs to learn how to utilize her powers. It looks like Skye/Daisy Johnson's uniform in Season 3 will be very Quake esq. First, she will sport a shorter and more serious hair cut. Also visible are very clearly the Quake gauntlets. The Gauntlets and uniform also sport the Quake symbol. "It's about strength. She feels very empowered in it.... That's what was important to me, that she felt empowered to me," .. "I wanted to stay true to some of the designs I saw in the comics. In the style lines, I wanted to pay a little bit of a tribute to her tactical ability from last season, but we also incorporated the Quake symbol into her gauntlets and on the back of her suit." "It's only something that Daisy would have and is specific to her earthquake powers,"
"It's a practical part of [the costume], cause when you put this on in real life, it's not that practical! I always wondered why superheroes wear such tight outfits, cause they're really tight and really limiting. It works onscreen, though." Who is Calvin Zabo/Mister Hyde Daisy's father?